Just over a fortnight remains until the Christmas charts are decided across a multitude of platforms, with the most excitement building around what will be crowned top single, video game and television show. And the markets are wide open with plenty of time remaining to place your bets leading up to the big reveal come Christmas 2016 as What Are The Odds breaks down who looks likely to take the No. 1 spots. A ritual almost as sacred as Eurovision, the race to be voted UK Christmas No. 1 is an annual honour we look forward to, and the yet-to-be-decided X Factor winner is already under fire. Year on year, the winner of the signing showcase rivals for the lead in this market and is 3/1 (4.00) to take the No. 1 spot this winter, but Friends of Jo Cox have usurped the lead this year and are priced at 6/4 (2.50), with Sky Bet, to steal the show this year. Cruz Beckham, youngest son of David and Victoria, is also in the mix as a 6/1 (7.00) dark horse with his debut single “If Every Day Was Christmas,” while Mariah Carey 12/1 (13.00), the Weeknd 16/1 (17.00) and The Pogues 33/1 (34.00) are also among the dozens of bet options. 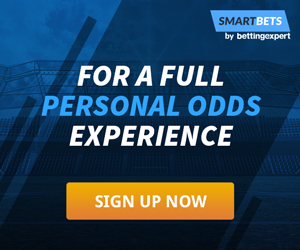 Table toppers Chelsea, currently boasting an unbeaten winning run of eight (8) Premier League games are the complete favourites to be top of the table at Christmas, 188Bet make them 1/1 (2.00) to claim the annual title. Liverpool are their closest rivals with odds of 5/1 (6.00). 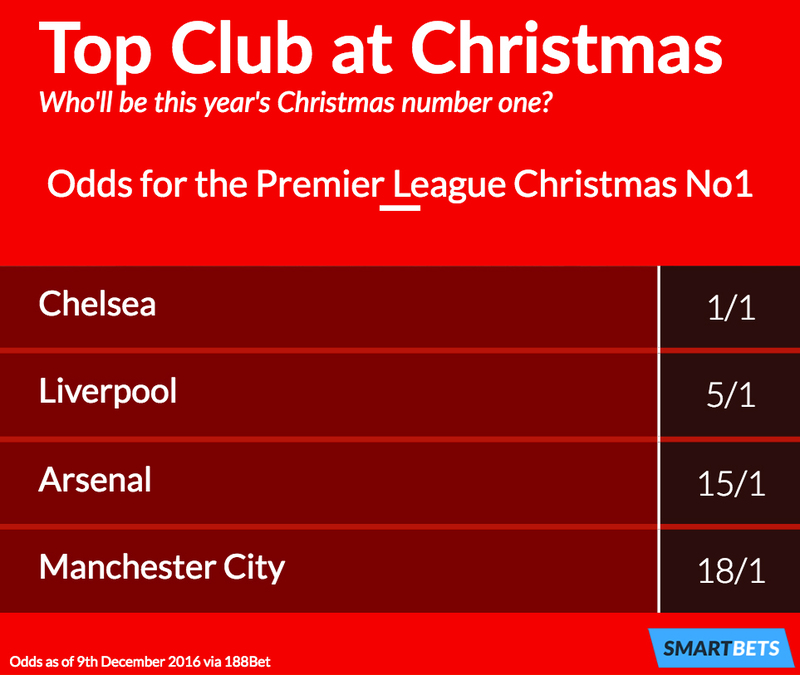 While Arsenal and Man City are way back at 15/1 (16.00) and 18/1 (19.00) to be top on the 25th of December. Remeber these odds aren't that reflective of the final four positions in the Premier League, it's just with Chelsea having a lead at the top already and three games before Christmas Day against mid / bottom of the table opponents, Antonio Conte looks set to keeping Christmas Day in the Premier League blue, after Leicester City held the number one spot in 2015. It looks likely to be a two-horse race for Christmas video game of the year as FIFA 17 and Call of Duty: Infinite Warfare top the billing, currently listed with Sky bet at 6/5 (2.20) and 5/4 (2.25), respectively, with nothing really separating the two. It’s a dark horse race from there, though, with Final Fantasy XV third in the running at 8/1 (9.00), while Battlefield 1, the closest first-person shooter competition to Call of Duty, is further back at 10/1 (11.00). One thing almost for certain is that we won’t see a driving simulator win this year’s gong, considering Forza Horizon 3 and F1 2016 are priced at 16/1 (17.00) and 25/1 (26.00), respectively, struggling to contend against their more action-packed peers. A stacked list of 15 options are available for Christmas No. 1 TV show, and the BBC has dominated this year’s pecking order. 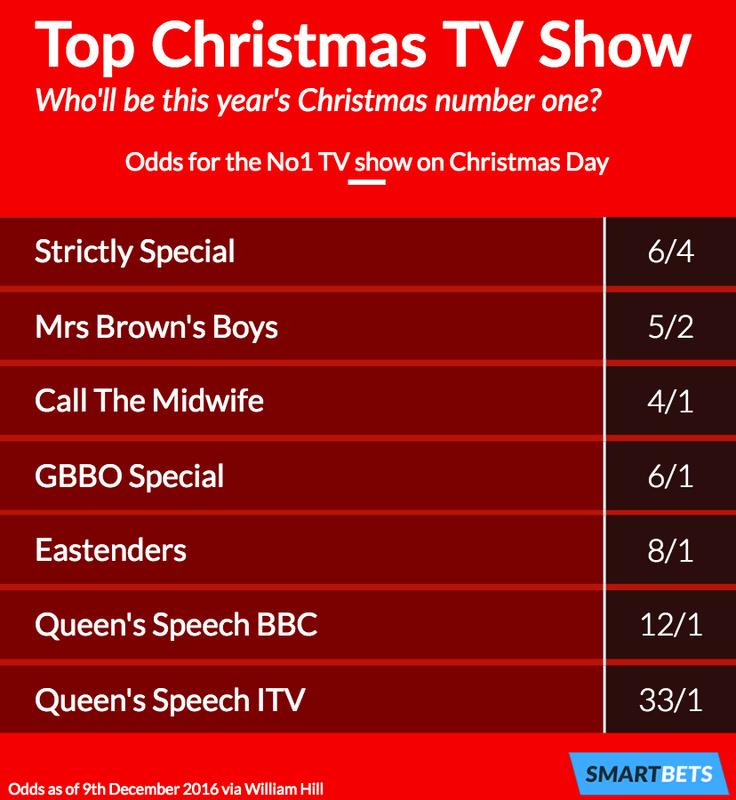 The Strictly Come Dancing Xmas Special leads the way at 6/4 (2.50), although ITV hit Mrs. Brown’s Boys is a stiff challenger at 5/2 (3.50) with William Hill. It’s a BBC bonanza after that as Call The Midwife, The Great Christmas Bake Off and Eastenders swiftly follow with respective prices off 4/1 (5.00), 6/1 (7.00) and 8/1 (9.00). The BBC continues to assert its dominance on ratings, too, as their broadcast of the Queen’s Christmas speech is favoured at 12/1 (13.00) to be deemed the most popular of the bunch, while ITV’s broadcast is way down the pile at a price of 33/1 (34.00).